You can’t beat the luxuriousness of entering a greenhouse on a sunny, cold winter day, and hitting that welcome wall of moist, warm air. Once you get through that soft wall, you drink in the redolence and visual vibrancy of green, growing plants. All this is possible even with a relatively inexpensive greenhouse, such as mine, which is, basically, 2 layers of plastic film supported by sturdy, steel hoops (plus thermostats, a propane heater, a cooling fan, and a “squirrel cage” fan to inflate the space between the layers of plastic for better insulating value). Still, a greenhouse — my greenhouse, at least — isn’t for virtual trips to Puerto Rico; It’s for growing edible plants, mostly fresh lettuce, celery, mâche, claytonia, and arugula to fill the salad bowl every day from late fall through early spring. This same benefit, though, can almost be achieved much more simply and much more cheaply with a coldframe. A coldframe, in its most basic incarnation, is a box frame covered with glass or some other transparent material and within which plants are grown or protected through the coldest months. I have both a greenhouse and a coldframe. The coldframe came first. With a greenhouse full of greenery, I admit to usually neglecting the coldframe, which is unheated and only 25 square feet in contrast to the greenhouse’s heated 750 square feet. Still, last fall I had an extra 25 lettuce transplants and lacked even a square foot of extra space in which to plant them in the greenhouse. So I spread an inch of compost in the coldframe, firmed the transplants into holes there, and then gave the whole bed a good watering before replacing the cover. Except for one subsequent watering, I’ve pretty much ignored the coldframe. The polycarbonate (‘Exolite’) cover is translucent so the coldframe’s innards are hidden from view unless the cover is lifted. Today, mostly out of curiosity, I lifted the cover to see what was going on inside. The lettuce was alive and had grown. Fall weather was admittedly relatively mild although temperatures here did drop below 10°F at least one night — pretty good survival for plants growing in little more than a covered box outdoors. With short days and cold weather, lettuce is growing very slowly. Individual leaves, perhaps whole heads, probably will not ready for harvest until towards the end of February. That’s if the lettuce survives that long, which it might not even in the coldframe, depending on the length and depth of winter cold. Spinach would more likely make it through winter; mâche and claytonia would definitely weather the coldest days and nights. In the absence of a greenhouse, I would beef up coldframe salad production to yield more and for more of the winter. I would, first of all, construct more coldframes because, with slow growth inside in winter, one harvest could decimate the crop, for a period at least, from just one coldframe. Anything that helps the coldframe fend off cold and retain heat would also help increase the amount and duration of harvest. Insulating the sides helps, and said insulation need be nothing more than wood chips or straw piled up against the sides. Or make the box itself out of whole bales of straw! Heat rises and glass and plastic are poor insulators, so most of the heat is lost through the translucent or clear covering. The Exolite cover on my coldframe is actually 2 layers of polycarbonate plastic sandwiching polycarbonate ribs that hold the layers 1/4” apart, proving better insulating value than a single layer. On really cold nights, an insulating mat, even just a blanket could be thrown over the cover. 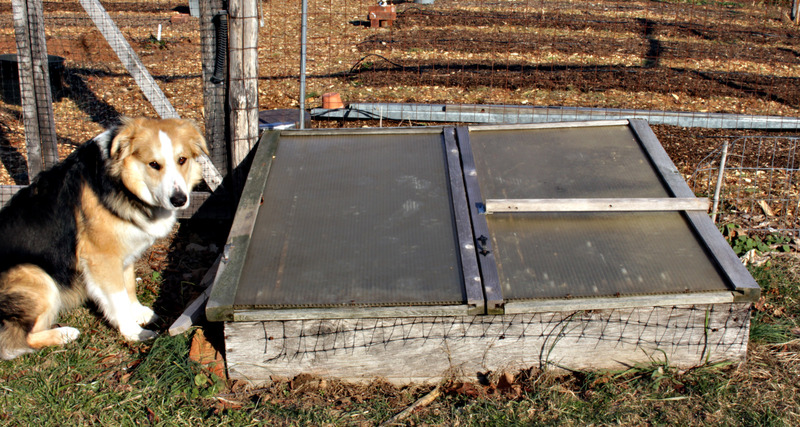 In Europe a hundred years ago, cold frames were used extensively for commercial vegetable production, and mats of woven straw covered the glass to keep out the coldest weather. A few feet down into the earth, temperatures remain constantly in the 50s. That earth is a source of heat, tapped into by sinking the floor of the coldframe a couple of feet deeper, which also allows head space for taller vegetables, such as Romaine lettuce. Too deep, of course, makes harvesting very inconvenient. And finally, winter production can be beefed up by actually heating a coldframe, in which case it’s no longer a “coldframe” but what’s called a “hotbed.” The traditional heat source for a hotbed is horse manure, layered into the bottom of the bed after a foot or so of soil has been dug out. A certain art is involved in getting the right amount and moisture content of manure, packed in just right and then covered with soil for a steady even heat. I made my coldframe into a hot bed a couple of years ago, or, rather, tried to. I didn’t get it just right; will have to try again. True, you can’t climb into a coldframe for a tropical junket, but the coldframe, with care, can become a hotbed of tasty, fresh, organic, very locally-grown vegetables from fall to spring. This entry was posted in Gardening, Vegetables and tagged cold frame, greenhouse, hotbed. Bookmark the permalink. Trackbacks are closed, but you can post a comment. I had to tell you: I had my first persimmon last week, as my doctor colleague brought me some that he had pickled. Never having had a persimmon before, I sliced said persimmon up and added it to my salad (not, unfortunately from my garden). It was AMAZING!!! I have never had such a flavor. Wow. I have been reading your posts for a time now, and I know you are fond of these little gems in New Paltz. IS there a variety that would grow in zone 4 up here in Jay? We do have a lovely south-facing slope where I have ample sun ….I have put in several fruit trees and bushes….but I fear that it is too cold here for persimmons. We have had -24 so far this month!!! thanks for a wonderful blog, I look forward to it! Szukis persimmon and some other American varieties would probably survive zone 4 but not have enough heat during the growing season to ripen their fruits. It’s been minus 18°F here and I have no worry about the persimmons. We have been growing our winter garden in 9 home made cold frames for years with a bountiful harvest of greens and lettuce every yesr. This year being one of the best. Happy to share a picture if deired. Have re-discovered your garden writings… tho I now am close to 90 and my gardening days are over, my interest is still keen, and am enjoying your writings about your experiences… and your good use of the language. Thanks Mr. R.
How wonderful for you! I picked up a used little greenhouse last year. It is unheated but I lined the floor with stone. I look forward to starting seeds in it when I migrate home in March. 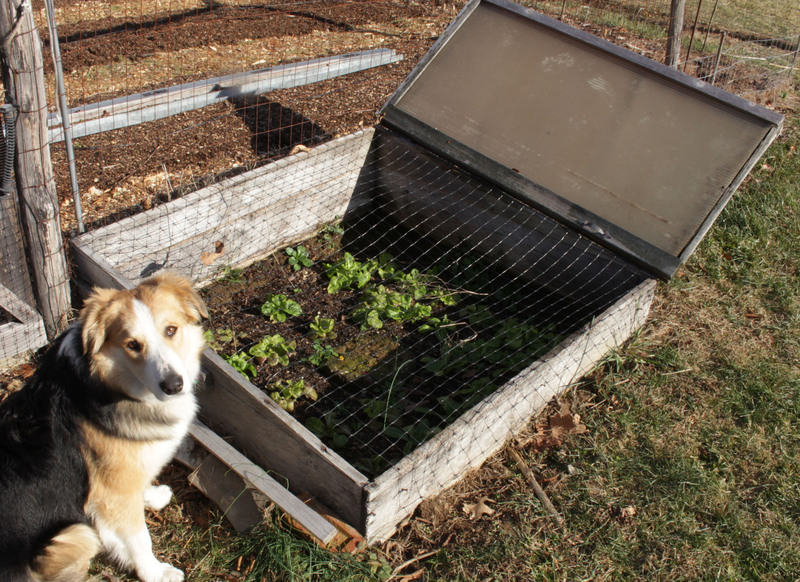 I had a cold frame – simply old windows resting on a frame with an slight angle. I didn’t plan enough to harvest all winter and we had so much snow and ice that it was difficult to keep it clear but I did manage to grow some kohlrabi and harvest an early batch of parsnips. I still have the frame and should find a new location for it (the greenhouse sits where it was). 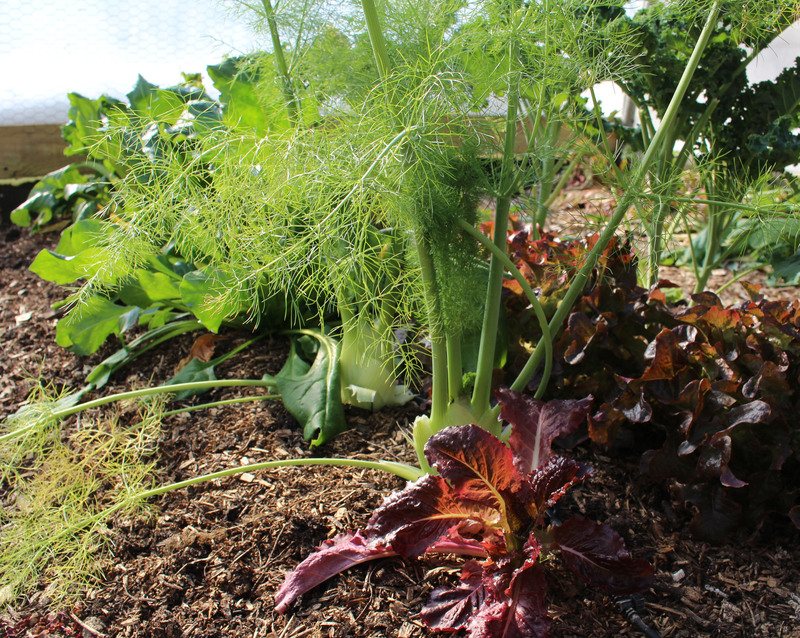 I think all Northern gardeners should give extended harvesting a try – oh the joy in even simple little leaves of lettuce! Sounds great — except for the kohlrabi and parsnip, my two least favorite vegetables.